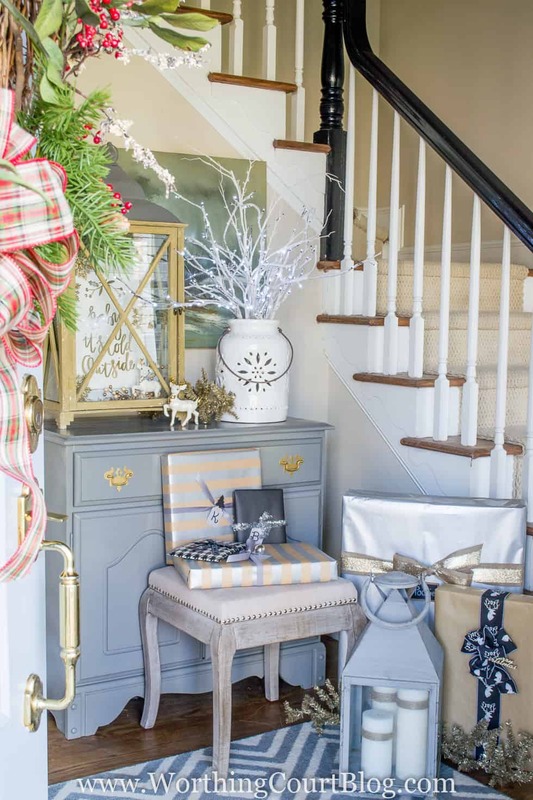 Welcome to my rustic and elegant Christmas foyer. Come on in! My foyer isn’t very big and that makes it impossible to photograph the whole thing in one shot. So, I’ll start on this little wall behind the front door. 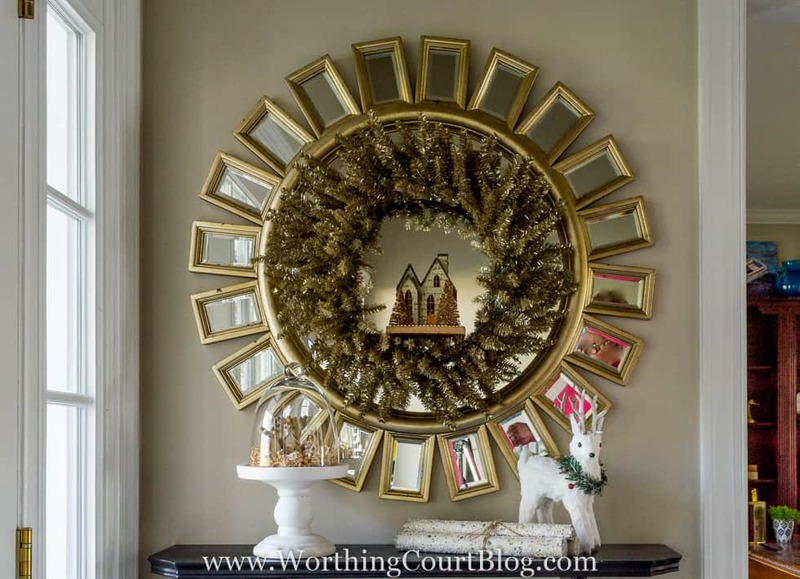 A burnished gold’ish wreath, that I picked up on clearance after Christmas last year, fits perfectly on the foyer mirror. I was going to place the glitter house on the shelf below it, but I just love it sitting in the wreath. 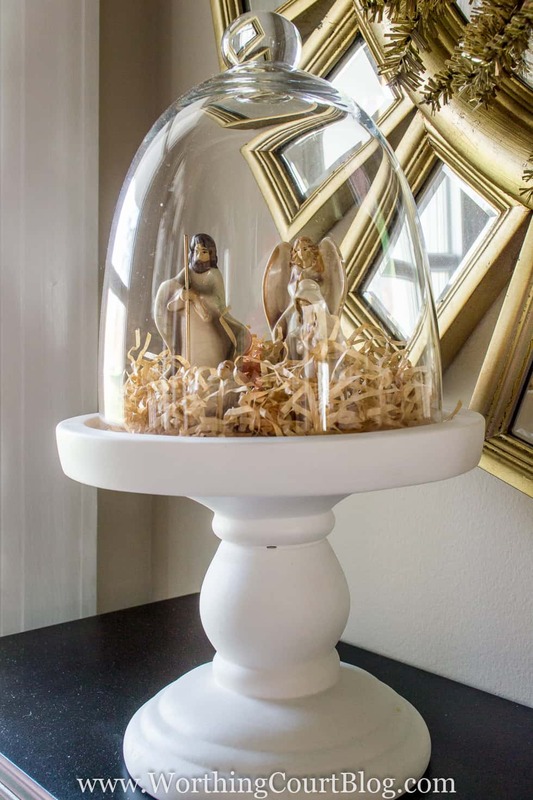 A tiny nativity set is very simply displayed under a glass cloche. Pretend you can’t see the dust particles, m’kay pumpkin? 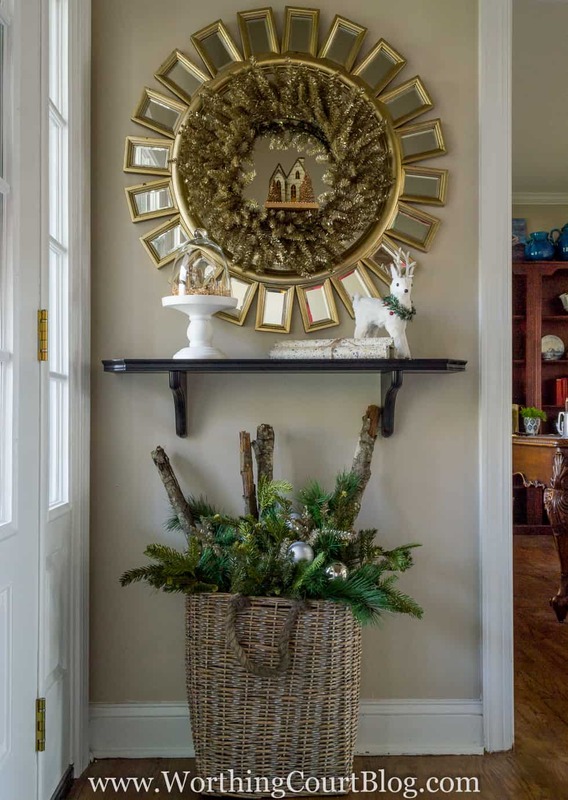 The basket below the shelf is filled with branches from the woods around our house, different varieties of faux greenery, burnished gold’ish branches and a few silver tree ornaments. 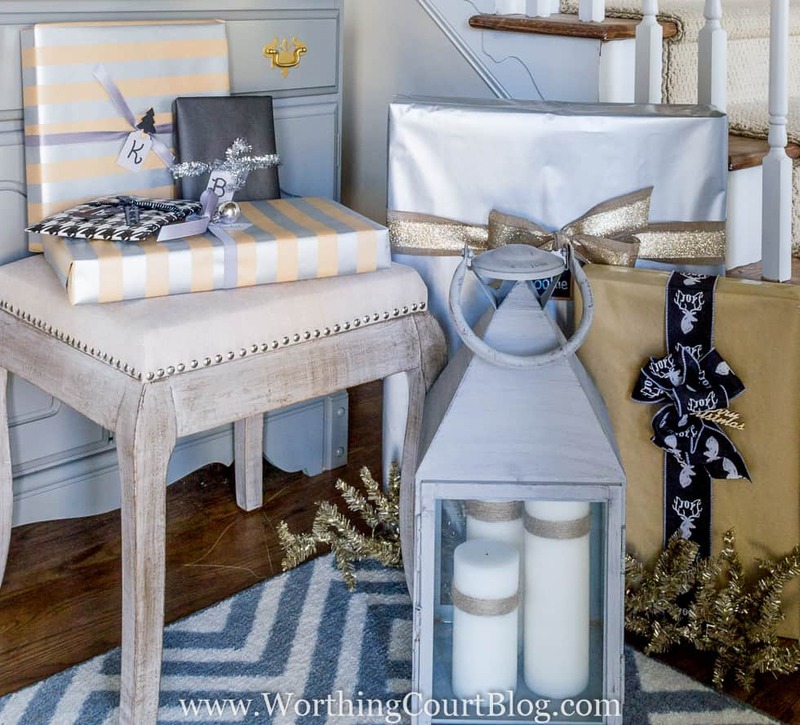 On the other side of the foyer, I loaded up the corner beside the staircase with a pretty packages wrapped in the neutrals, grays, black and silver that I’m loving so much this year. There is so much going on on the floor in front of the chest, that I kept the decorations on top it pretty simple. 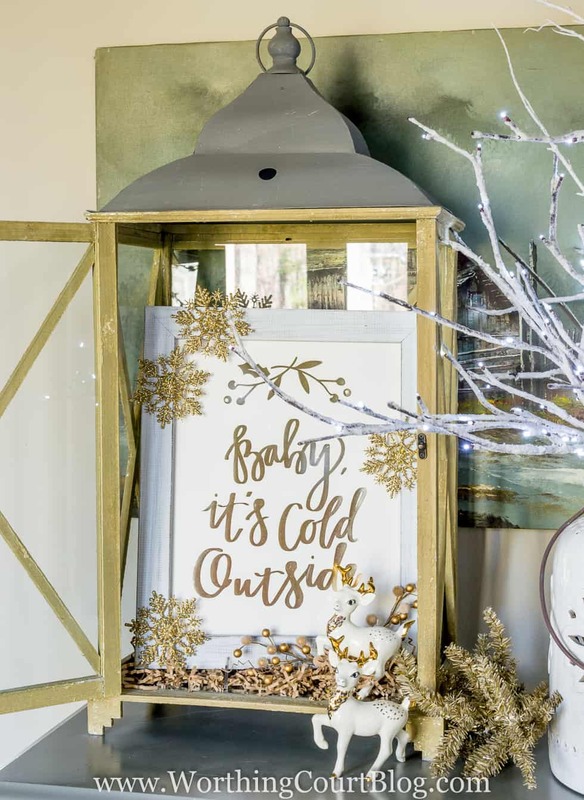 All of the Christmas decorations in my foyer were inspired by this beautiful Mistletoe Baby, framed 11 x 14 gold foil print, that was provided to me by Minted. 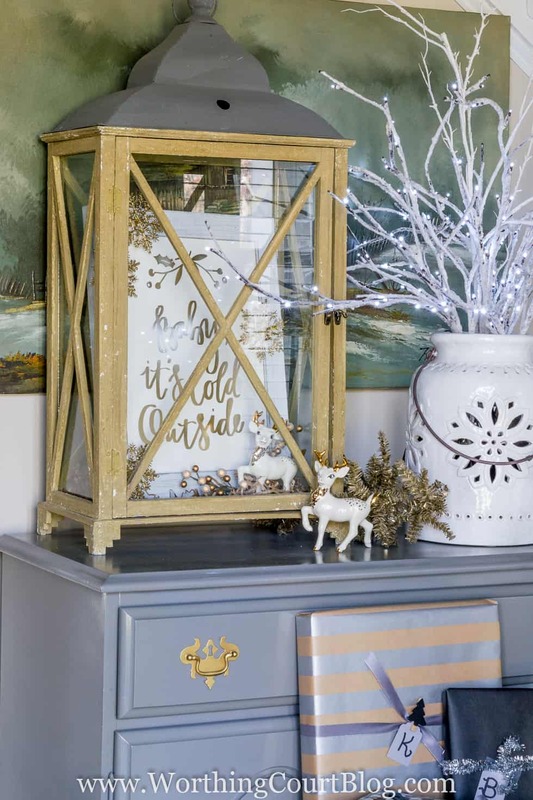 I was able to choose the type of frame that I wanted and thought this Distressed Cottage White frame would fit in perfectly with my mix of rustic and elegant. 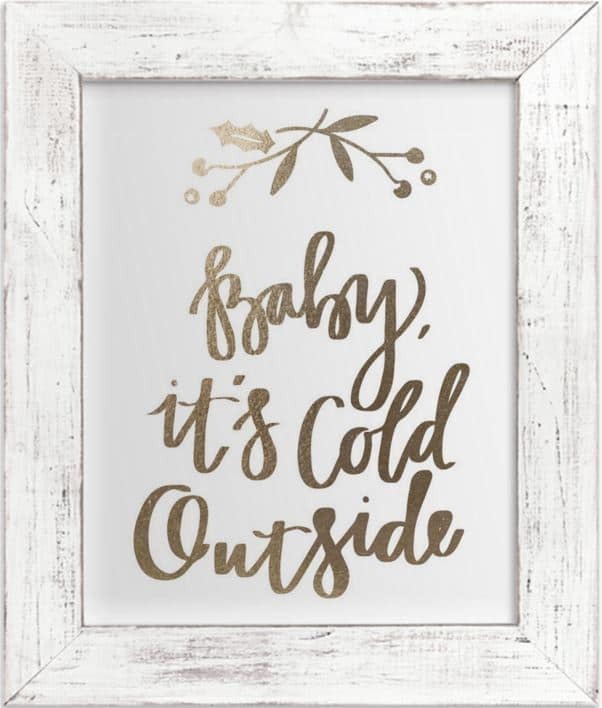 That’s one of the great things about the Minted website – if you are ordering framed art, you can preview it with different frames to see which one you like. This post contains affiliate links for products that I use and love. If you click and make a purchase, I will earn a small commission at no additional cost to you. Read my full disclosure policy HERE. As soon as I received the print, I knew exactly what I would do with it. I thought that it would look great tucked inside of my large rustic lantern. I embellished it by sticking some glittery snowflakes to the rustic wood frame. Let me show it to you with the lantern door open so that you can see it better. Drat that glare! Those little deer have great sentimental value to me. My mom made them waaaay back in 1959, when ceramics were a huge hobby for a lot of people. These two are all that are left of the entire set of Santa’s reindeer and sleigh that she made. Do you have any sentimental Christmas treasures that you pack away ever-so-carefully each year? My foyer looks quite a bit different, now that we replaced the dark mahogany door with one filled with glass panes. So much more light pours into the foyer during the day now. This will give you a bit of an idea of the layout and what the new door and sidelights look like. Do you know about Minted? I could spend hours on their website drooling over the myriad of pieces that they have to choose from. The website if filled with work that is sourced through on-going competitions. Follow them on Facebook and Twitter. All of that wonderful silvery blue, absolutely gorge! I love that huge basket in the front! So beautiful! Very inviting! Can’t wait to see it!! Your foyer looks beautiful, Suzy. I love the colors you featured. And, your new door looks wonderful. So much glorious light. 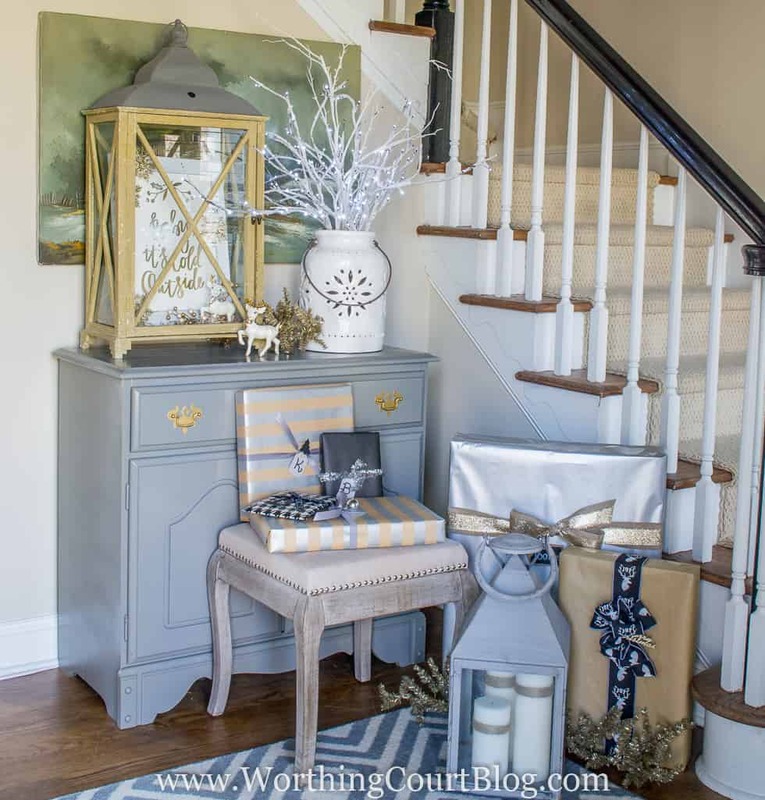 Your foyer decorations are beautiful! So inviting! Since I’m a new subscriber I’m catching up on all of your goodies. 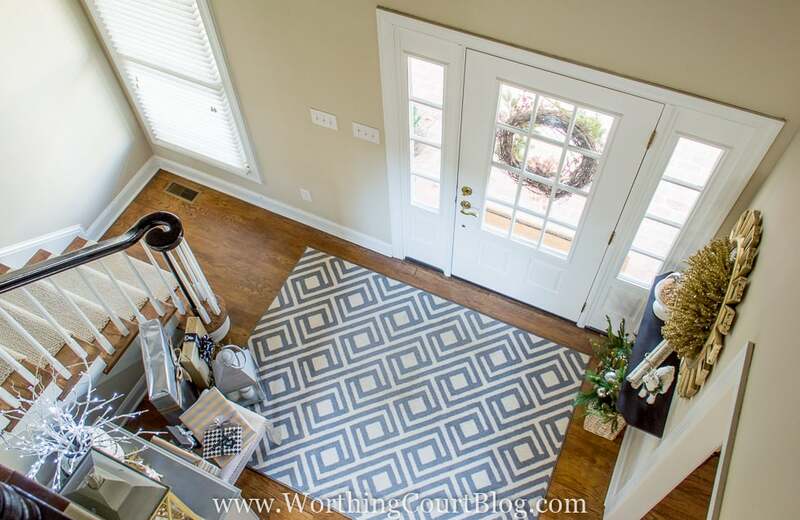 Love the basket on the floor with greenery from your own yard. 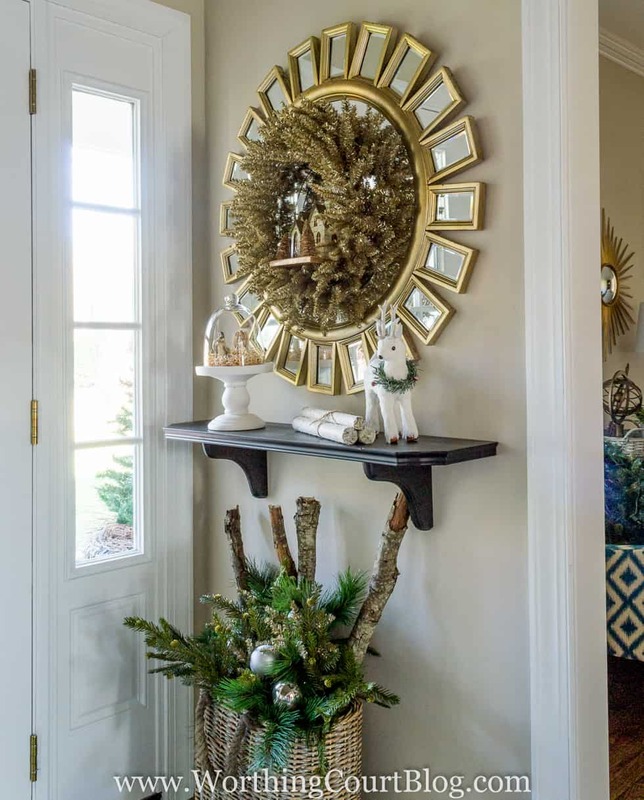 To find a wreath that fit your mirror was perfect. I also caught a glimpse of the ribbon on your front door wreath. 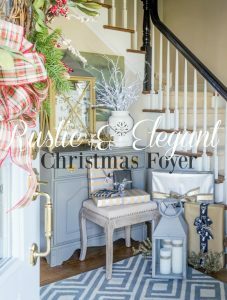 I go crazy for ribbon at holidays, especially plaid.